The next part of my book that I have to write is Deucalion and Pyrrha, the end of the flood. All mythologies have a flood myth in their beginning. Noah, obviously. Deucalion and Pyrrha for the Greeks and Romans. Utnapishtim for the Sumers, from the Epic of Gilgamesh. Nata for the Aztecs. Manu for the Hindus. Cessair in Irish myth. Korean. Aboriginal American. Egyptian. Chinese. “Many cultures have myths relating to one or more inundations, referred to as the Flood or Deluge, sent to eliminate the human race, usually with an advanced warning to enable a few to survive to repopulate the world.” - J. A. Coleman, The Dictionary of Mythology. The flood is always to punish the “sins” of man. Man, once made in the image of the Gods - a creature above all other creatures on Earth, has transgressed, has fallen to chaos and discord. And so, water - the great equalizer - falls from the sky to wipe away Man and press the reset button on mankind. Always, there is a man chosen to survive. Deucalion. So what does this man - the chosen man (or in some cases the chosen woman) feel? Think? Want? Remember? Do? The earth is of utmost importance in Ovid’s version of the myth. Imagine what Deucalion feels the moment his feet touch dry land. Imagine the first taste of food. Deucalion is a sailor returning from months at sea. But what is he returning to? Nothing. The end. No, the beginning. A new beginning. Just him and Pyrrha. His wife, whose name means fire. I imagine that legs itch to run against the simple solidity of rock and dirt. I imagine that he bends to pick up a handful of dry sand and watch it slip through his fingers. These fingers, there are only twenty of them left in total. The toes that bury in the earth - there are only twenty of those as well. And the eyes that survey what’s left of the world - the swept clean, silt lined, downtrodden world - there are only those eyes and two others. What a mighty task that awaits them. One man, one woman. To repopulate the world and rebuild the cities. And all the time, to tell the stories that will prevent this from happening again. His story. The story of his father, Prometheus, who gave fire to Man. The story of Zeus and the Titans and the beginning of the world. The story of the downfall of the ages of man. What stories he must have in his head to tell his children and their children. To tell the race of men that spring from the rocks they cast behind them, the bones of the earth. The children of the Earth. Mankind are born from Gaia, from Mother Earth. My musings on the flood myth, and on Deucalion, as I prepare to write about his first steps. This, roughly, is the first part of the book I’m writing, an adaptation of Ovid’s Metamorphoses. Remote beginnings to our modern times. In the beginning there was no light or earth or sky. There was only Chaos. The abyss. The absence of all. From this discord, the Gods created life. From the abyss they tore the sky from her sisters, never again to touch. From the abyss they tore sea from earth. These sisters they would doom to always be touching, but always separate. The Heavens, she watched lonely from her place with only Gods - her sister’s children - to comfort her as they created their own home in her breast. From a union of sisters, Earth and Sea, Prometheus created mankind. Vain as the Gods were, they moulded from mud a creature in their own shape. The world which was given to humans was a world of milk and honey. Without Strife, men lived as Gods upon the Earth. Descent arrived. When Saturn fell he brought about a new age of man. An age of temptation and the beginnings of Strife. Man himself brought about the next age. A bronze age - a race of war and wickedness. messenger n.: a person who delivers - a package or a message - from one person to another. see also: don’t kill the messenger. I’ve no business of my own. No agenda, no ideas worth anyone’s mention. No, I am simply a messenger god. 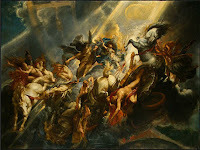 At least Mercury got a past - a story and a lively confrontation with his brother Apollo. Not me. I’ve always been Jupiter’s messenger. Or at least I was, until Mercury got himself those winged sandals. In any case, this was all before Mercury. And I was charged with a mission. To deliver a real message to mankind. Over a cup of ambrosia, Jupiter turned to me and said, “Iris, something’s really got to be done about all that racket bellow us.” I agreed. I always agree. No one argues with a man with lightening. Jupiter remained quiet. He gazed out over the clouds, his brow furrowed as he watched the strife below. Years and years from this moment, man would sculpt Jupiter as such, a thoughtful God. But now, the only thing they carved was each other’s flesh. “Flooded?” I asked. For clarity. Never to question his judgement. Messengers never ask questions. “Yes. Have Zephyr lock up the north wind and release the rain from the south,” he said. I nodded. “And you,” he fixed me with his gaze. Looking into Jupiter’s eyes is like being in a lightening storm. You’re drawn to its power but terrified by its danger. “You gather the waters and refill the clouds. Then go tell Neptune to release the rivers, streams and seas.” I nodded again. I popped over to tell Zephyr and Neptune of their brother’s plans, and then set to my own part. It was peaceful to watch the waves roll over the Earth. The houses and forests on her front were washed away. The animals and humans floated past, wolves and sheep side by side. Birds fell from the sky in sheer exhaustion. The Earth sighed with relief as her sister’s embrace healed her wounds. Above me, I could feel the Heavens growing heavy, itching to join her sisters. Jupiter would never let that happen. That would mean the end of us as well as the mortals. Finally, the Seas calmed and I let the clouds run dry. Helios, on his chariot, drove past to warm the Earth’s surface and help pull her from her sister’s arms. And I watched, a rainbow above the world, just below the Heavens. I watched as the Earth, my mother, emerged a blank slate, ready for mankind to ruin all over again. Next is Deucalion and Pyrrha, but I still have to work on that part a lot.